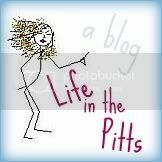 Life in the Pitts: I think I need to start a new blog. I always say, "don't dance like nobody's watching...dance like they are and you don't give a blankity-blank". You are not responsible for other people's happiness. That said, do what makes you feel comfortable. I agree with Donda. whatever makes you happy, and less stressed. Was there another incident when they visited you guys? Come on...I JUST found your blog! You can't leave now! Awwww. I don't want you to censor yourself. I like your stories... they are real. Not sure what people would see that needs to be hidden. :( Just be true to yourself, that's all you can do. That being said, that really blows. I very much enjoy your writing. maybe you get to a certain age and you stop giving a flip about what people think. We don't sensor ourselves and like it. Our idea is if you don't like, want to see it or want to know, don't look at our website. *censor. And I need spell check for commenting. duh. Honestly I think its a necessary evil, especially as you become a doctors wife. The world of medicine and suits and law are too wide open these days to say anything that can't be misinterpreted. But how fun to totally reinvent yourself! I think the same thing all the time! So is it the Kurt meister who's doing the editing? I feel like you're pretty funny, funny enough to tell Adam about you a few times. That's part of why you have so many followers. I'm liking the color, and don't worry... it fades. How is "Abby"? ;) It stinks that you're going to be in primary now and I won't be able to hear some of your fun comments in R.S. I am so with you! I worked so hard building up my blog, but I can't write everything I would like to because of some families members reading it that make me feel uncomfortable. It's so frustrating. I don't know what to do! I can understand that! I wish I could pick which post some people can see. Good luck! I'm in the same boat. My original blog was my home for years, but I have to give it up for security reasons related to my husband's job. I hate saying goodbye to my readers and starting over with a new secret identity, but it's the only way I can continue blogging. I think that you should do whatever feels right for you. Ultimately, blogging is an exercise in personal expression, so you should feel free to express yourself. Oh, girl, I highly recommend it. It's not that I say anything that I think is really bad or trashing the people that I'm keeping it from, but it's just so freeing to be able to say whatever I want and not have to worry about someone then calling me about it or thinking that it's dinner conversation.